Launched in 2010, one-ship line Voyages to Antiquity is the latest effort from cruise entrepreneur Gerry Herrod, who headed up Ocean Cruise Line, Orient Lines and Discovery Cruises. The cruise line -- which is targeting U.K., U.S., Canadian and Australian passengers -- entered the market in 2010 with a selection of Mediterranean cruises on Aegean Odyssey (the former Aegean I). Having sold his single vessel, Orient Lines' Marco Polo, in early 2008, Herrod essentially was out of a job. But, after reading Lord John Julius Norwich's "The Middle Sea," a historical account of the fabled ancient civilizations that flourished in the eastern and central Mediterranean, he was inspired with an idea for a new cruise line. Herrod contacted the author, who agreed to help him craft voyages for a new cruise line that would focus on ancient civilizations and the journeys of ships of the past, including visits to ports of significant historical and cultural interest. The itineraries would take passengers to see the still-visible remnants of ancient Egyptian, Greek and Roman life. Initially, Voyages to Antiquity featured only nine itineraries between March and November, but since November 2012, it has doubled its total offering. The nine additional itineraries are part of a winter program to Southeast Asia, India and the South Pacific, which provides variety and an expanded geographic region for the line to continue its practice of cultural and historical cruising. The focus of each itinerary is the destination, with plenty of onboard lectures to educate passengers on the cultural and historical background of the places they'll visit. Shore excursions (nearly all included) are the highlight. For example, in Palermo, passengers tour the 1,000-year-old mosques that were finessed into Christian churches by Sicily's Norman conquerors, and in Libya, they spend two days touring the well-preserved, seldom-viewed Roman ruins of Leptis Magna. Originally launched as a ferry, Aegean Odyssey is the sole ship in the Voyages to Antiquity fleet and carries 378 passengers on unique culturally themed itineraries. One-ship line Voyages to Antiquity puts a huge emphasis on learning throughout each cruise -- guest lecturers play a big role in the cruise experience. Among those presenting the daily lectures are professors from great British universities, a former ambassador, historians and chefs. A frequent lecturer is historical author Lord John Julius Norwich, who helped plan the cruise line's itineraries. Voyages to Antiquity is marketed as a "premium, small-ship product." The ambience is country-club chic: never dressy, never sloppy. The public address system is seldom used, other than for the captain's daily update. Gratuities are included in the basic fares, as are most excursions and wine and beer with dinner. While lone cruise ship Aegean Odyssey has no casino or showroom, plenty of enrichment opportunities are available onboard. The entertainment is purposely low-key, usually just a string trio, a pop ensemble or a pianist playing show tunes -- no midnight comedy acts, no dance troupes, no bingo. Yet, the small library is filled with books on the ancient world, encouraging passengers to embrace education and enrichment on their cruise holidays. Facilities include a small swimming pool and a compact spa. There is no assigned seating for meals, and the mainly Filipino waitstaff will remember your preferences. Dining venues include an open-seating dining room named Marco Polo and the Terrace Cafe and Grill -- a casual buffet restaurant with an alfresco section that's home to "Tapas on the Terrace." Afternoon tea is served in the Terrace Cafe, and hors d'oeuvres are offered during the late-afternoon cocktail hour and again after dinner in the Charleston Lounge, which also features musical performances. Cabins range from 130 square feet (inside and outside cabins) to 550 square feet with balconies (Owner's Suites). There are 26 dedicated single cabins (4 inside, 20 outside and 2 balconies). Many of those onboard are former passengers of cruise line founder Gerry Herrod's earlier ventures, Orient Lines and Pearl Cruises. Because of the educational focus of Voyages to Antiquity itineraries, the passengers tend to be educated, intelligent and curious. Generally, these discerning travelers are well-to-do, older than 50 and speak English as their native language. 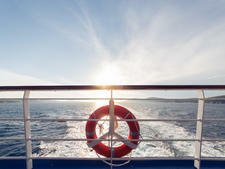 Voyages to Antiquity cruises are marketed in the U.S., the U.K., Canada and Australia. The line purchased a single ship (the former Aegean I), which was built as a ferry in the early 1970's and renamed it Aegean Odyssey. Aegean I sailed most recently on charter (for the now-defunct Renaissance Cruises and others) but was laid-up for several years after a deal to send it to Louis Cruise Lines in 2005 fell apart. A major refurbishment of the ship -- from cabins and public rooms to the galley and funnel -- cost three times more than the purchase price of the ship, according to Voyages' managing director, David Yellow. Aegean Odyssey's capacity was lowered from 570 to 378 by creating larger cabins via the combination of smaller cabins. An additional reconfiguration in early 2013 created 18 additional outside cabins by relocating the spa to replace 10 inside cabins. Yellow says there are no plans to add other ships. Aegean Odyssey focuses on European, Cuban and Caribbean itineraries, with new sailings this year including Iceland and the Northern Atlantic. Odyssey covers these regions with about two dozen itineraries, ranging in length from 10 to 16 nights.